We spotted this Viceroy butterfly while stalking frogs along one of the many irrigation canals on the Bosque Del Apache wildlife refuge in New Mexico. It was during the heat of the day and frogs are not an easy stalk at anytime, but it was in the 100’s and we were sweating and questioning what the heck are we doing. For whatever reason the Viceroy made it all come to fruition. I had my 500mm lens with a 1.4 extender and I was pushing the envelope to focus as close as my subject was. No time (and too hot) to run back to the car for the macro kit. So you work with what you got. Beautiful – I love monarch butterflies, and I’m seeing less and less of them the last few years. 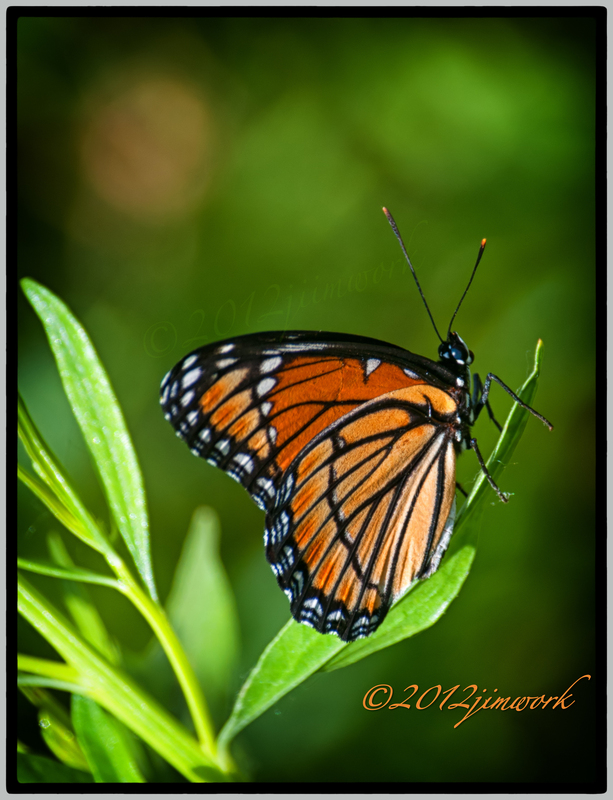 Lynda…I too love the monarch, they migrate through our area of SW TX and the population was sure down this year. This is a Viceroy, you can see the large vertical black vein on the wings and Monarchs or the similar Queen butterfly do not have.